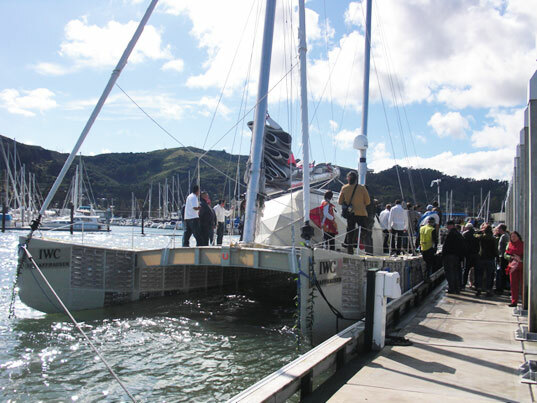 San Francisco recently saw the unveiling of the Plastiki, a boat constructed of 12,500 2-liter plastic bottles that will be embarking on a 7,500 mile journey to Sydney this spring. Built by Adventure Ecology and captained by David de Rothschild, the vessel will brave the waters surrounding the ‘Great Pacific Garbage Patch’ in an attempt to bring awareness to the mounting plastic debris floating in our Oceans. If the 50 knots of wind and rain at the unveiling last Friday, followed by tsunami warnings post-earthquake in Chile the following day, are any indication of what the crew could face on their voyage, we wish them luck! 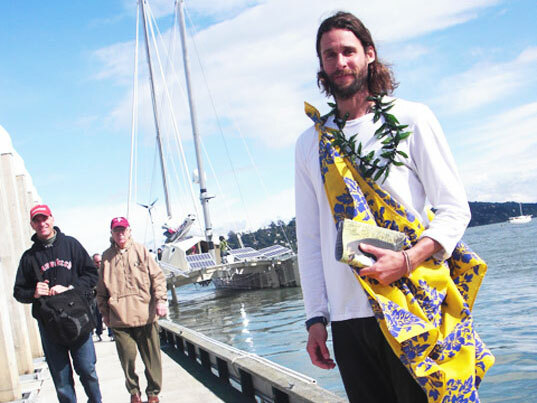 David de Rothschild, adventurer, environmentalist and founder of Adventure Ecology, became inspired (or perhaps perturbed) by a 2006 report issued by UNEP. Called ‘Action Urged to Avoid Deep Trouble in the Deep Seas,’ the report contained the fact that plastic debris outnumbers plankton in many of the world’s oceans. Adventure Ecology’s ‘message in a bottle’ is that we are all responsible for plastic waste because we all use plastic, and despite the fact that much of the plastic we use is 100% recyclable, less than 20% of all plastic bottles ever reach a recycling facility and 4 out of every 5 plastic bottles end up in the landfill. It would appear that the other 1 out of 5 ends up in our Oceans. As David de Rothschild told us at the unveiling, ‘the minute we are born, we get a plastic bracelet with our name on it,’ and nearly everything we do after that involves plastic in some way. According to Project Aware, only 1 out of the 15 billion pounds of plastic produced each year in the U.S. gets recycled, and an estimated 38 billion plastic bottles and 25,000,000,000 Styrofoam cups end up in landfill, annually. Hence the concept of a boat made out of 100% recycled plastic, set to sail through the Pacific Gyre to bring awareness to the problem and inspire change. The boat is, in fact, made up of 12,500 2-liter plastic bottles tied to Self Reinforcing Polyethylene Terephthalate (SRPET), all bound with an innovative organic glue made out of the shells of cashew seeds. 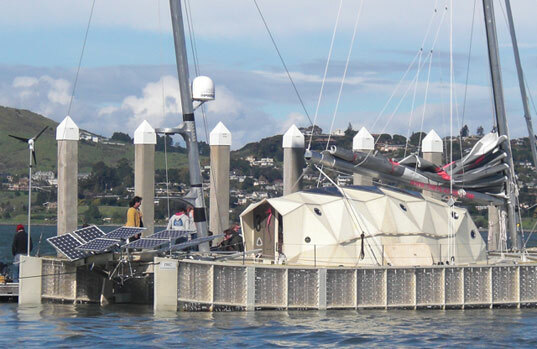 Architecture for Humanity took on the project of designing the ‘off-grid habitation’, or cabin of the 60-foot catamaran to house a crew of six. David de Rothschild is currently joined by skipper Jo Royle and co-skipper David Thomson, along with Josian and Olav Heyerdahl – the grandchildren of famed explorer and archeologist Thor Heyerdahl, whose 1947 expedition across the Pacific on a raft called the Kon-Tiki inspired the Plastiki’s name. The 7,500 mile route from San Francisco to Sydney is expected to take several months, while the crew will rotate at planned intervals. “The thing is not to make plastic the enemy, but to reassess how we use, dispose, and reuse it,’ says David de Rothschild. Along with the obvious use of wind, bicycle power has also been incorporated to provide additional propulsion, and everyone on board has a daily part of the journey. Rain catchment and a vertical vegetable garden (i.e. 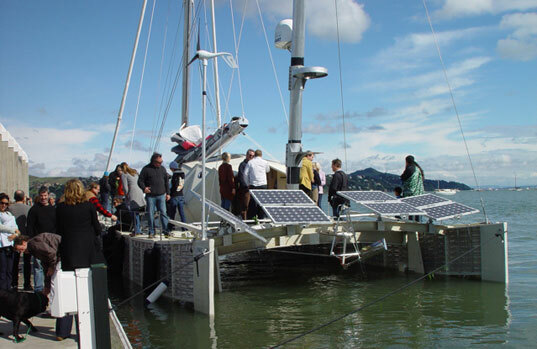 sprout farm) with rotating hydroponic water treatment helps the crew stay nourished, and an array of solar panels keeps the boat charged. Technology partner Hewlett Packard and communication sponsor Inmarsat, make up the boat’s communication hub and provide a constant link to the outside world, despite the journey’s ‘off-grid’ exploration. Other sponsors include IWC Schaffhausen and Kiehl’s eco-skin products, and no doubt a multitude of innovative eco-adventure products will result from this unique journey. In fact, the Plastiki Project has already inpired a spin-off competition called SMART Art: Science Marketing Art Research Technology, to show how discarded items can be redesigned into works of art as well as functional everyday items. At press time, the crew is waiting for a window in the weather forecast to set sail through the gates of the San Francisco Bay Area, heading south to San Diego and Baja and then into the Pacific Gyre en route to Sydney, Australia, all the while spurring awareness about the mounting waste in our oceans. Plastiki Cabin Architect and Architecture for Humanity designer Nathaniel Corum concurs, “As we get more and more urban we’re going to have be more clever with our waste stream.” Speaking of urbanites, we can all follow the Plastiki’s day-to-day progress through www.plastiki.com and hopefully fuel the fire of awareness around this important cause. So it seems there are 6 out of 5 plastic bottles out there. One in the ocean one in the landfill and the other four in the landfill?